The cold food section upfront, originally uploaded by Camemberu. Yay! Another bumper post! Hubby, lil' Nadine and I went to Carousel to pig out a bit after a dreary week. This is the old Cafe Vienna at Royal Plaza on Scotts, given not only a facelift but upgrade in terms of food (and prices) as well. It's halal Continental and Asian in a chic, new environment. The warm food section towards the back, originally uploaded by Camemberu. 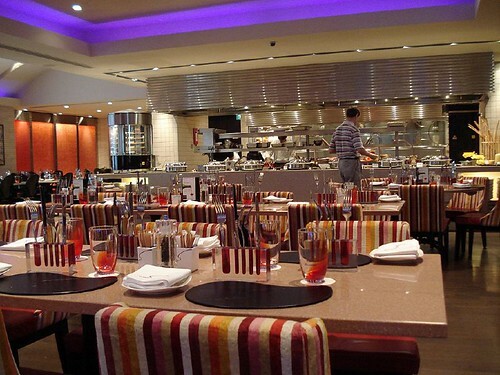 We liked the new decor, and thought the place was well thought out in terms of managing large buffet crowds. The food is split up into two sections - cold stuff and appetisers out in the front, warm food and mains at the back. Desserts were along a perpendicular wall linking both sections. Altar of Desserts!, originally uploaded by Camemberu. 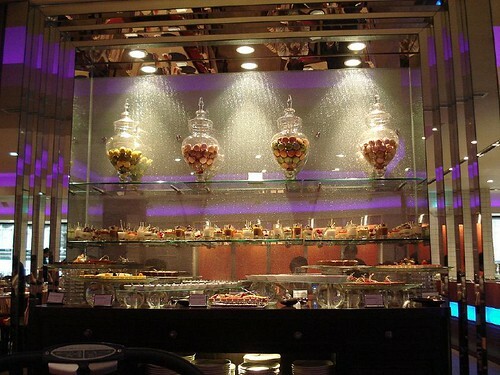 There are at least three of these dessert alcoves. This is the first one. The second one is completely dedicated to a 4 or 5 tier chocolate fountain with skewered fruits ready for dipping, and ice cream in three flavours. Third one has fruits and warm desserts. 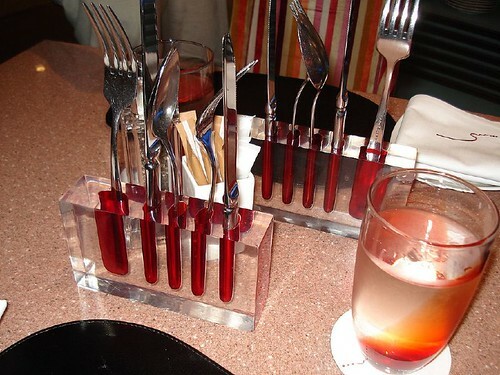 Chic cutlery stand - they replenish every utensil you use, the moment you take it out!, originally uploaded by Camemberu. I have to say the service is very much improved. Staff are alert, quick, attentive and polite. Constantly but discreetly paying attention to your table, replenishing water AND cutlery (every time you use something, you get a fresh set put in your holder!). They are always on hand too, to attend to needs or help with spills (which are prone to happen when you bring naughty babies along). Sashimi and sushi, originally uploaded by Camemberu. All right, on to the food! Unfortunately I didn't capture on camera all the food we ate, and on top of that, we weren't able to sample half of what was available in this huge buffet. So what you see is just a small representation. 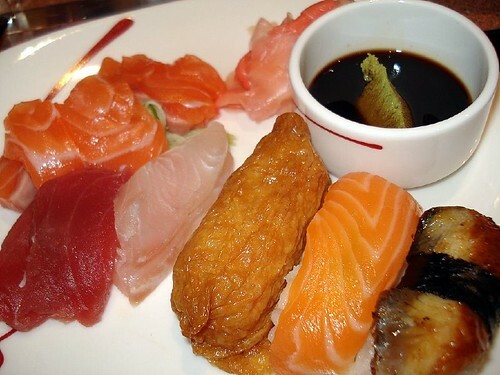 I began with the sashimi (salmon, tuna and sea bream, I think) and sushi (inari, salmon and unagi). I skipped the futomaki and forgot about handrolls. Although reasonably fresh, the sashimi didn't look too well-cut but at least did not taste bad or sinewy. The sushi was decent. 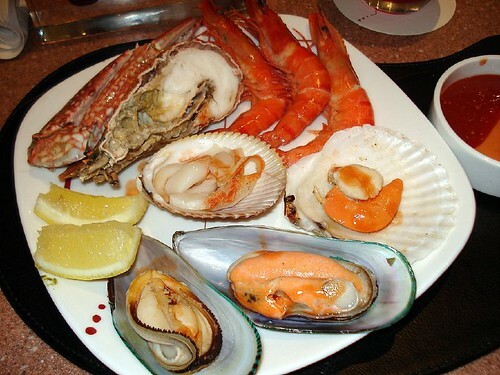 Cold seafood platter - blue swimming crab, slipper lobster, boiled tiger prawns, steamed sweet clam, scallop, poached green lip mussel and Spanish black mussel, originally uploaded by Camemberu. 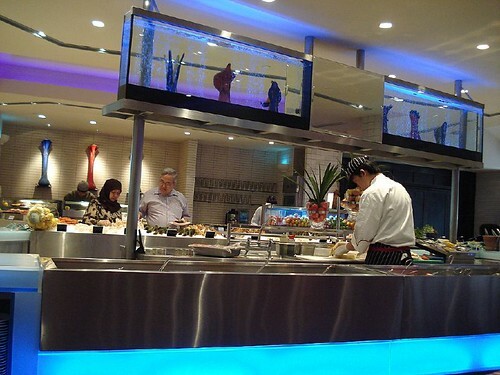 Carousel now boasts a large spread of seafood and indeed, a whole counter of ice proudly sports various fruits of the ocean. All succulent and sweet. Have them with lemon, tabasco, cocktail sauce, hot sauce, shallot mignonette or just plain. Wish I had gone for a second round. Oh, and the waiters, or butlers as they are called here, serve you moist towelettes after you are done. Nice touch. Cold appetisers - DIY Thai salad, mushroom terrine, cured salmon in spiced lime vinaigrette, marinated prawns with avocado tomato salsa, smoked duck breast, originally uploaded by Camemberu. There is a nice Thai salad station where you can put together your own green mango/papaya/pomelo salads (recipe cards on display to help with ingredient choice). I didn't get to try the other cold prepared salads, just the appetisers, which were okay but not spectacular. 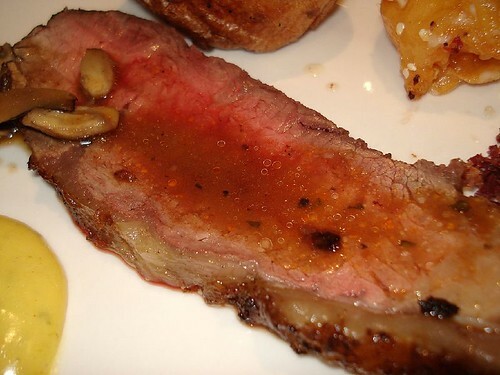 Sirloin from the carvery, originally uploaded by Camemberu. The rotisserie featured black pepper chicken (which I skipped) and oven roasted grain-fed beef which I thought was quite yummy, although hubby didn't like it. Team it with Yorkshire pudding and jacket potatoes, along with condiments (so many to choose from!). The professional pasta station next to the rotisserie looked enticing but it would have been too much carbo for me. 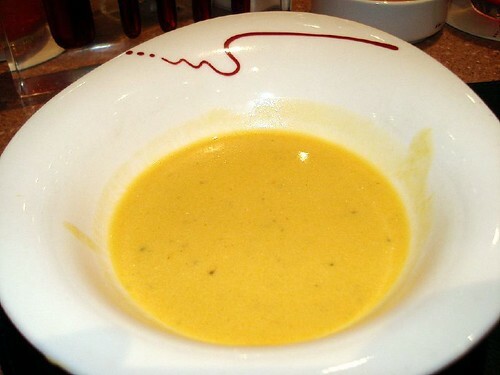 Pumpkin veloute with truffle hint, originally uploaded by Camemberu. Oh this was nice! A simple-looking soup but it had a savoury, umami richness I can't describe. Hubby, again, didn't really like it (it's okay, we always differ). There were also some other soups - the seafood tom yum was done more Malay-style than Thai, and the morsels within overcooked. 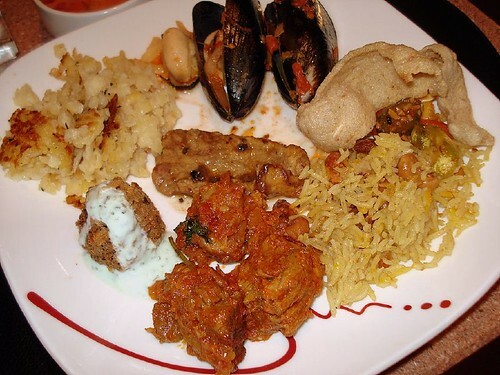 Hot mains - potato and onion tortilla, stewed black mussels in fennel and tomato broth, saffron rice with achar and fish crackers, mutton rendang, lamb koulet with mint sauce and beef scallopini with kalamata and anchovies, originally uploaded by Camemberu. 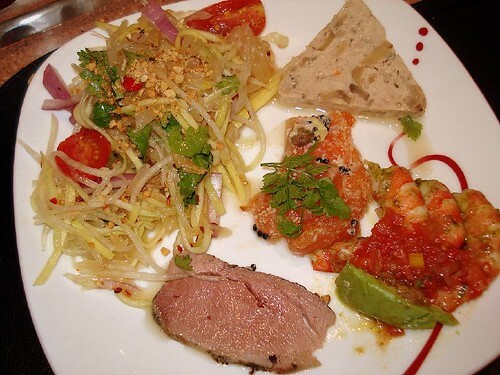 There are so many main dishes, it's almost impossible to try everything. One really good one was the mutton rendang - even hubby who avoids lamb/mutton, thought it was more than edible. The mussels were in a very strong fennel and tomato broth - think I prefer them cold with tabasco and lemon. It was a pity I had no space for most of the Asian mains, much less the breads and cheeses. Oh, and I really liked that the hot dishes were elegantly presented on ceramic/electric stove tops rather than in those clunky, metallic chafing dishes. 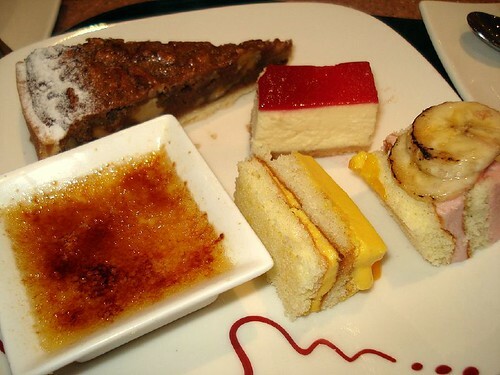 Desserts - (top to bottom) pecan and walnut tart, raspberry cheesecake, coconut creme brulee, mango delice, mousse of exotic fruits, originally uploaded by Camemberu. Real dessert fanatics may not be overwhelmed by the range or variety here but I thought it was adequate (mainly because I was too full to eat anything more). The coconut creme brulee is a must-try here - simply sublime! Nadine loved the cheesecake! 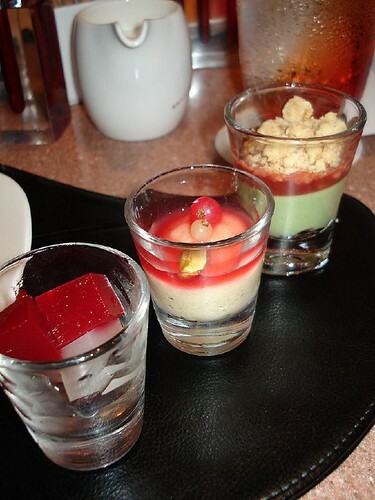 Sweets in shooters - (left to right) lychee and raspberry agar-agar, semolina pudding with redcurrant coulis, strawberry crumble (not sure what green mousse is) , originally uploaded by Camemberu. Somehow all the shooters I chose had this sourish fruity accent, something I'm not big on. Should have gone for the mini tiramisu! Ah, the bread and butter pudding with vanilla sauce was comforting, as was the cherry clafoutis. Didn't try chocolate pudding or the chocolate fountain. In all, we had a very happy meal. Quite good value for S$35++ per person (weekend lunch). This place can almost challenge Melt at the Oriental, which is slightly pricier. I'd be quite happy to come back to Carousel. All the stripes do bad things to my eyes, but the buffet selection looks lush. Shouldn't you be avoiding raw food now that you are pregnant? nice nice. the theme is halal continenet and asian food? Well, (^@^), thanks for your concern but yes, I'm aware of the risks. They are quite often overblown. Ladyironchef: yes, halal and S$35++ but if you have a Citibank card, you get 10% off. Do check first for card promo validity when you make reservations though. Not sure when it expires. For fried hokkien prawn mee, I recommend Geylang Lorong 29's. Its great. They gonna feature the son's branch at East Coast Road on Makansutra. For Japanese pork cutlet, try Tonkichi at Shaw House. Alot of Japanese go there. Woo.. the food looks good with quite a variety. Looks worth the $35 per head. Better than some high tea buffet that costs the same, but miserable variety. (^@^): You having a baby too? Congrats! Well, for sure there are certain foods we should minimise during pregnancy (I don't do raw beef/poultry/eggs/shellfish or unpasteurised milk/cheese). There is no end to the paranoia - you can even get food poisoning from salads and cut fruits! Oh, thanks for your food recommendations too.